In this picture, taken in our tool room, Isabella (the silhouette in the background) is deburring tube ends with the grinder and Polly flattens them with the press. These tubes are for our next project, the Zorba dome which will be a verandah for the outside area behind the kitchen. 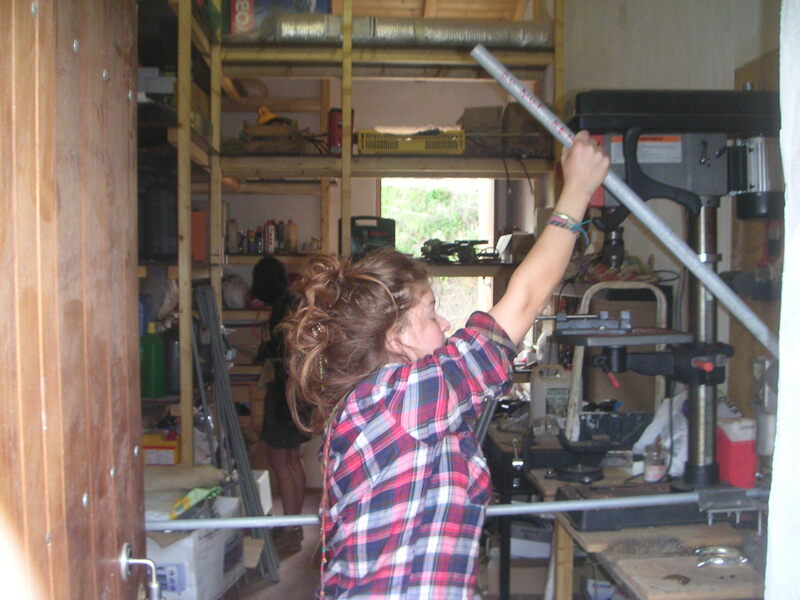 It’s not only men who enjoy doing mechanical jobs, Polly finds working with the press absolutely wicked! Luisa invited two friends for lunch. 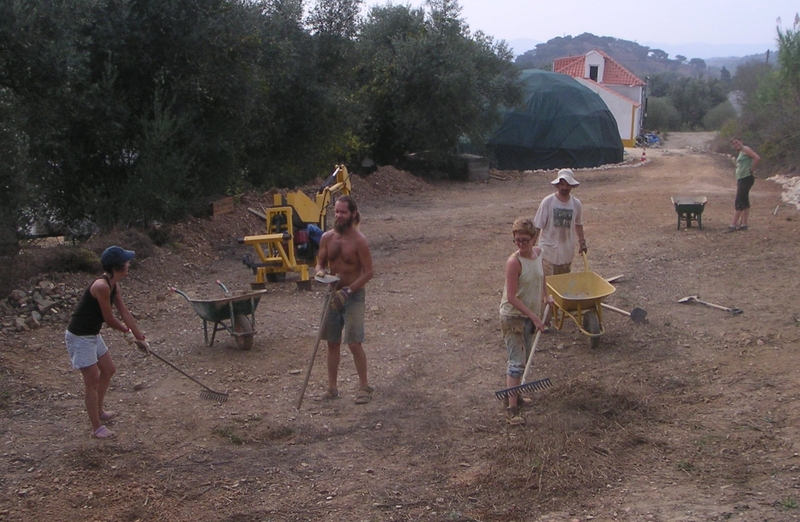 They bought property in this area recently and are also developing plans for renovation of their house and to create a Permaculture water landscape. 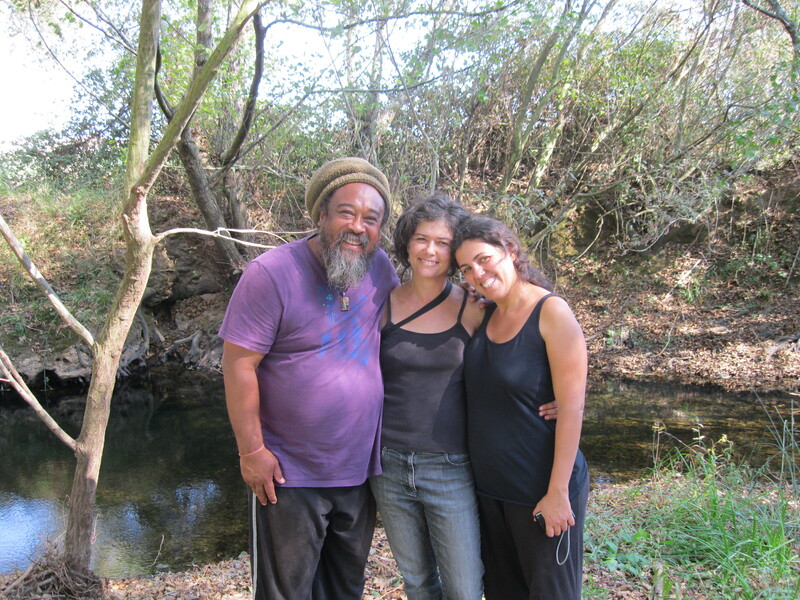 We visited the land of Mooji and Radha recently and yesterday they came to look at our house, the domes, the garden and, best of all, to enjoy this beautiful spot by the river near the small lake and the rapids. After a long hot summer that seemed to be never ending it is finally a little cooler and rain is expected within a few days. Time to look around for last minute repairs and painting work outside. 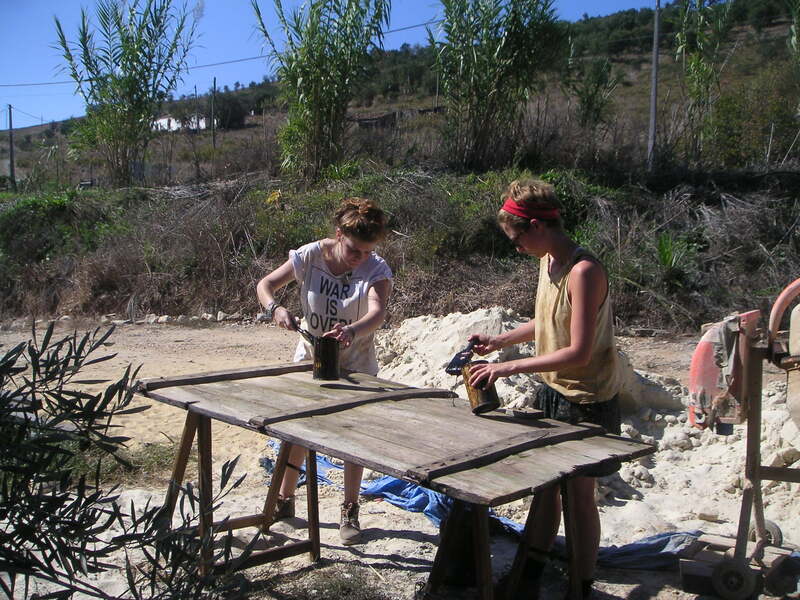 In the picture Polly, who arrived from England yesterday and Isabella, painting the old barn door that will get a new life as a garden door, with, as usual, a mixture of linseed oil and pine tar. This week our ranks were reinforced by the arrival of Philippe, a tree specialist from France. 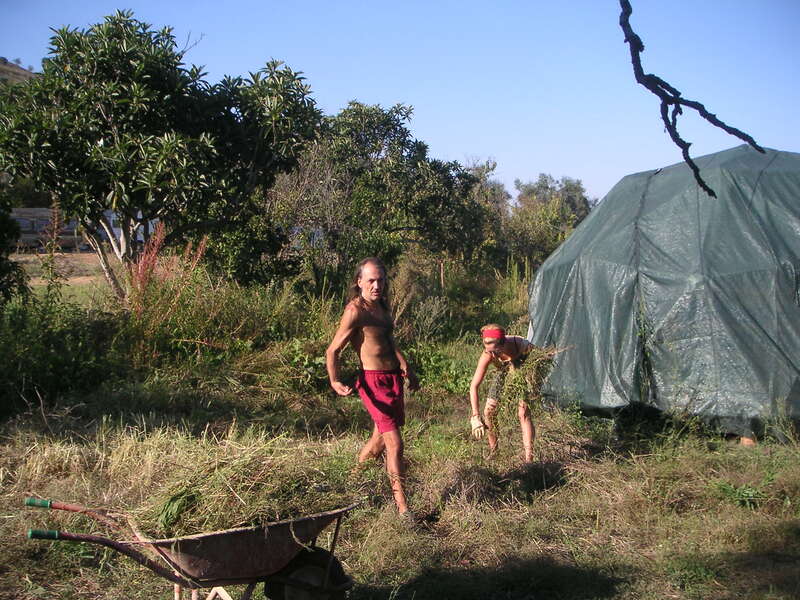 Today he and Isabella were clearing the area behind the garden dome, to make what the French call a pépinière, a place where we will start to raise fruit trees. We can use some, because not only Raw Foodism is popular among our volunteers but also Fruitarianism. By the way, if you are a Breatharian, we have fresh air in abundance here. 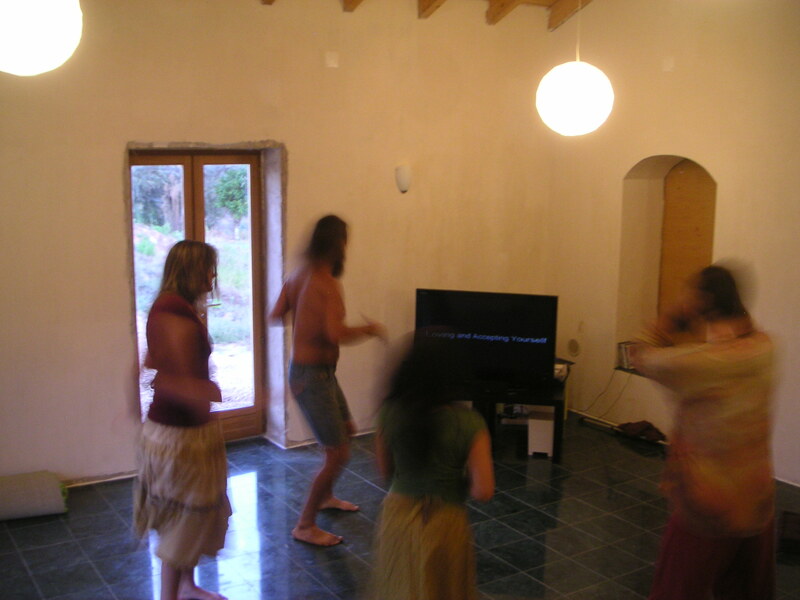 We were dancing, singing, listening and meditating yesterday evening, for the first time on the green marble floor of the Osho Garden Auditorium. After hearing Osho speaking on Loving and Accepting Yourself – and a tea break with banana cake – we heard Ananda sing and play a variety of instruments. Visit our Youtube channel to enjoy samples of this musical event. I thank everyone who helped to advance our project so far. The inauguration of the Osho Garden Auditorium on Friday, October 7th starting 6:30 pm with an Osho evening meeting, followed by a musical event with Ananda at 8 pm.